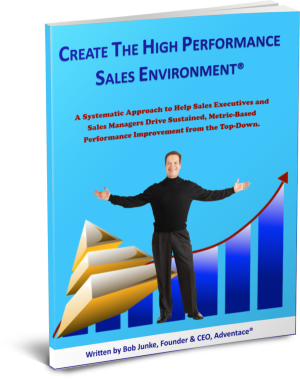 Our book provides Sales Executives and Sales Managers with a systematic approach to help them drive sustained, metric-based performance improvement from the top-down. Bob Junke, the Founder and CEO of Adventace®, wrote this book because of his passion to help Sales Management run highly effective sales operations. He applies his 25+ years of experience working with Sales Management teams from hundreds of companies across North America, Europe, the Asia/Pacific Region, and South America. The objective of the book is to empower Sales Executives, Sales Managers, and aspiring Sales Managers by giving them a proven set of processes, tools, and metrics, along with the identification of key functions that automation should provide. The result is that they are better able to drive their sales operations and create proactive sales cultures. Complementing his “how to” analysis, Bob interweaves entertaining, highly relevant, and often humorous real-life experiences, all of which provide important lessons about how to Create the High Performance Sales Environment®. I have worked with Bob over the years and seen the methodology grow and stay ahead of the pack. He has captured the essence in his book. Any salesperson aspiring to be a sales manager, sales managers, and sales executives should read this book and view it as the Bible for how to run a sales operation.